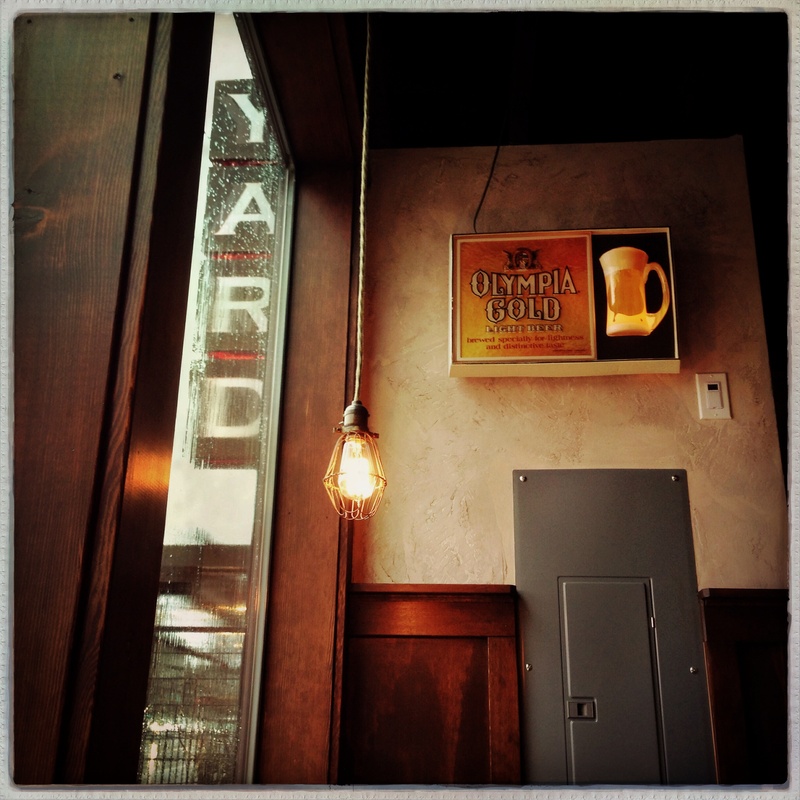 The Yard in Seattle’s Greenwood neighborhood is our favorite place to relax on a wet Northwest afternoon while Ryan attends a new debate workshop at the fantastic writing school, 826 Seattle. The school is a wonderful place but I’ll admit, the chance to hang out in a bar with my husband and some great food and drink is one of the reasons I’m so happy to sign him up for a new class every few months. Posted as part of the Weekly Photo Challenge: Inside. Every time I drive past Tumwater, I shed a tear. I used to love the commercials for Olympia, especially the one about the Artesians (hope I spelled that right) It’s the water LOL. We moved to Missouri in 1996, do they still make Oly? “It’s the water” was a fun ad campaign. 🙂 The Olympia brand is till around but the brewery in Olympia, WA was closed in 2003. This image is SO Northwesty! The rainy window, the burnished wood, the Edison bulb on a cloth cord all feel so old … but the electrical panel keeps it real! We even had the Artesian ads up here in Alberta, Canada. Great pic. I laughed about the debate workshop. I debated competitively and it was the worst decision my parents ever made as it taught me to argue endlessly with them………now it is just my husband on the receiving end (LOL). Oh boy, I’ve noticed Ryan jumping in to argue a lot more and thought it couldn’t all be part of being almost 13… What have I started!! Love seeing favourite watering holes through the eyes of a local! I love it too, it’s a great way to learn about new places! Hanging out in a bar in the afternoon when it is raining seems so decadent! As they say, That’s gold! It is on my list of light fixtures to add to my old house. Love your golden image, Lisa. How nice to be able to accompany your husband to his writing course and then hangout together over a good meal, afterwards. Thanks – too bad it doesn’t work that way! We’ve had a few light showers, but no ‘proper’ rain as yet…fingers crossed for more! Love the colors you captured!! This is a great photo-I love the color and textures and the angle-a great slice-of-life image! Thanks! I like sharing slice-of-life moments and am happy to see you enjoy them! love the ambience here – those colours are so rich! Looks like a still from an old film noir! Something starring Richard Widmark and Barbra Stanwyck most likely.